Flash Screensaver Maker can package favorite flash movies in one Screen saver. These movies can be played at one time or one by one. You or the end user can set many features of every movie such as playback range, time frame, scene domain,quality,background color etc. Certainly, you can save the movies package as a normal executable file and send it to your friends. ...... Flash Screensavers Maker lets you create professional windows screen saver which carries powerful settings from Macromedia Flash movies . If you want to package many flash movies, please select Flash Screensavers Maker. Simply import your Flash animations into Flash Screensavers Maker, follow the various steps to customize your own Flash screensaver. 2 Multiple Flash files in one time. 5 Flash files can be previewed as thumbnails. 6 Easy-to- use and Fast Wizard Interface. 7 Drag and drop interface. 8 Complete Flash 3, 4, 5 and MX Support. Create professional screen savers and shockwave flash screen savers in minutes. Create and distribute stunning 2D and 3D screensavers. 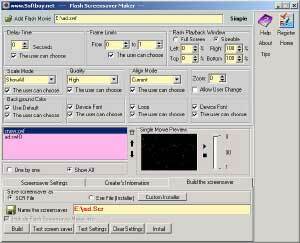 Flash2X Screensaver Builder is a program to create Flash screensavers. Make your own slide-show screensavers with photos, music, and text message. Easily Make your own Professional Screensaver in Minutes! Make own slide-show screensavers with photos, music and text captures. FlashPoint Screensaver Creatorr.Supports Office 2007 now. Screensaver Maker - Make your own Professional Screen Saver in Minutes! Qweas is providing links to Flash Screensaver Maker 6.1205 as a courtesy, and makes no representations regarding Flash Screensaver Maker or any other applications or any information related thereto. Any questions, complaints or claims regarding this application Flash Screensaver Maker 6.1205 must be directed to the appropriate software vendor. You may click the publisher link of Flash Screensaver Maker on the top of this page to get more details about the vendor.